MELKADIDA, Ethiopia—In a remote corner of Ethiopia cluster five refugee camps, filled with Somalis who over the last 10 years have been driven from across the border by extremist Islamic violence and several years of punishing drought. Now, Ethiopia, with the help of U.N. agencies, NGOs, and private corporations is looking to turn these refugees into citizens, to help them become self-reliant, rather than dependent, and to transform their camps into cities—sustainable cities. It is a bold plan, finding a permanent solution for those marooned in transient camps. My husband and I have had a front row seat as this effort gets off the ground, as work is being done to bring power to the camps and a newly burgeoning agriculture to this semi-desert. We arrived in mid-November on a dirt runway at the airport in Dolo Ado, or “Dollo” as the locals call it. This is Ethiopia’s southernmost eastern region that backs up to the Kenya and Somalia borders, a tri-country place where all the local peoples mix and mingle, trade and deal. 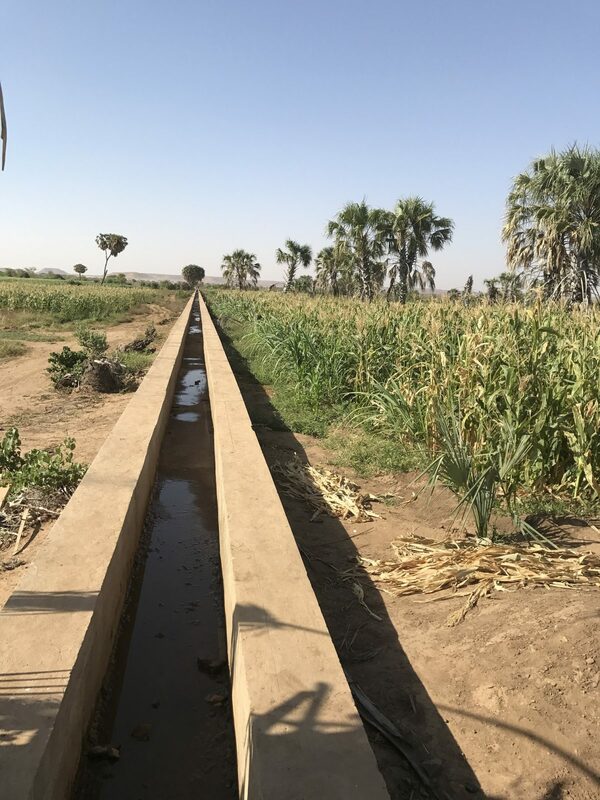 The Ganale River has never dried up and gives birth to the possibility of sustainable life for these refugee camps, host communities, and Dolo Ado city. Around 220,000 refugees are living in the camps Buramino, Hilaweyn, Kobe, Melkadida, and Bokolmanyo. Upon our arrival at our new home at the Melkadida United Nations High Court of Refugees (UNHCR) base, George Woode, head of UNHCR Sub-Office, briefs us on the situation here. The weather is a scorching 110 to 120 degrees Fahrenheit during the day and the rainy season has just ended. For months during our stay here the sun is always shining with not a cloud in the sky, so it is no surprise that solar power seems to be made for this environment. My husband is here with the group Engineers Without Borders (EWB). They have been assisting UNHCR’s Energy Team with installing five mini-grid solar systems for the medical clinics in each camp, plus small solar home systems for elderly or vulnerable persons so that these people will have lights at night and a charging unit for cell phones. Before we arrived, a solar street light program was already underway. EWB is also assisting with the training of ten persons from each camp dubbed solar technicians, who will specialize in solar energy repair and future installations. The technicians have been working on the solar street light program with the help of an American company called GAIA Partners. In the near future, the solar technicians will earn a livelihood directly from the community by fixing, installing, and maintaining these solar technologies, without the camps needing to rely on outside support. For now, the Ikea Foundation has provided the funding for the solar projects in these five camps. The foundation wants to make sure these solar projects get off the ground, and, when completed, hand them over to the camps for their direct ownership and care, so the camps can be independent and on their own. Abdullahi Mohomed Adow is the energy ambassador and head of the solar technicians at the Bokolmanyo Camp. 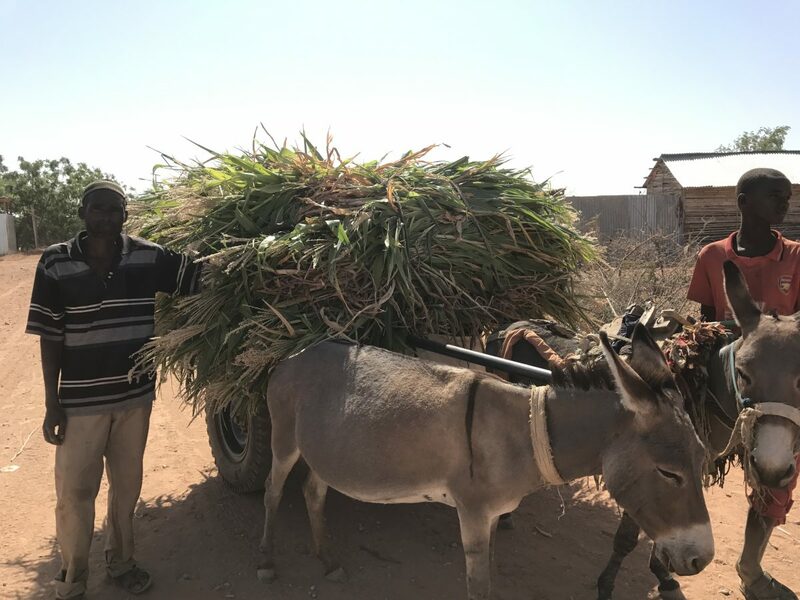 He has been at the camp for eight years now, and, coming from a busy Somalian city, it was hard for him to adjust to rural life at the camp. I was told it was very dark at night before the solar street lights came. Since their installation, I hear stories from each camp about how the young girls are safer and how people are now able to avoid the snakes and scorpions that crawl around this area after dark. At the handover of two mini-grid systems to the Bokolmanyo health clinics, the new owners are presented a list of new responsibilities, solar care instructions, and how to budget the new systems now that they will not need to use the older fuel-sucking generators any longer. 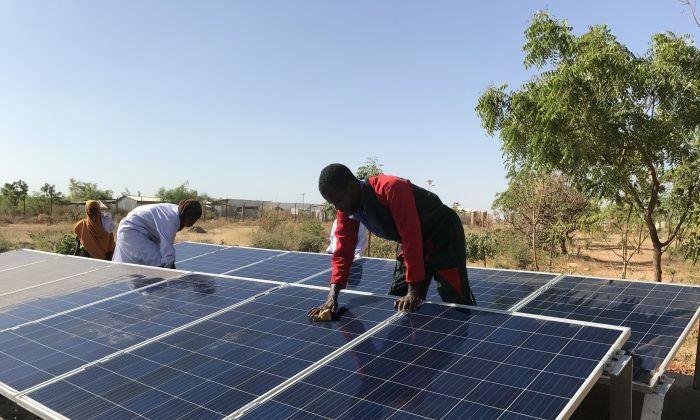 “The fuel costs saved should go into the budget for batteries,” explained Diana Benato, UNCHR’s Energy Teams head coordinator, who led the handover to the smiling faces of the doctors and nurses that now own the solar grid systems. In 2018, 650 more solar street lights will be installed, 4,500 small solar home systems will also be put up in the homes of the beneficiaries, and 52 other larger mini-grid systems will be up and running in the next few years. The larger mini-grid systems will either supplement or supplant the use of diesel generators to provide power to the camps. I ask Adow what he sees in the future of Bolkomanyo as far as energy independence goes, and if this place can really become a city. I do not see a city here in the very near future, but we see it in the future for sure, and it is exciting. It will come. An “Energy Awareness Day” in each camp brings out hundreds of people, both young and old, who learned about the importance of taking care of the solar street lights and the importance of solar independence. The events are spirited, with a live band that sings original songs about solar energy. Also, a live drama is performed. In one act, a young kid throws a rock to break the solar street light as he feels it is too bright, and he cannot make out anywhere with his new girlfriend. As a result, an older lady walking in the now dark area falls and gets stung by a scorpion. All the actors scold the young boy for breaking the light. Then the solar technicians get called and come to fix the light. The audience sends a loud round of applause and laughs, and the music plays again. At the UNHCR compound, we pile into Toyota 4×4’s and head out on the dusty, rocky terrain that the locals call roads here. We bump along, passing goat herders and a few donkey carts along the way while avoiding washed out cement bridges that used to go over the flash flood areas during the rainy seasons. The air is very hot, dry, and thick with dust. Our AC is not working in the over 100-degree heat, and my thin scarf serves as a filter so I can breathe. Then in the distance, we see green vegetation, like an oasis, against the crusty brown and red colors that dominate everything else. “That’s the Ganale River!”, exclaimed Awale Degewoine, the UNHCR associate agriculture officer who works the agriculture sector in the five refugee camps in the area. He points his finger and traces the green horizontal line in the distance. The Ganale is a major river that flows from northern Ethiopia and then joins the Dawo River from the south and the Webi River from the north to become the massive Juba River that pulses through Somalia like a lifeblood, before finally spilling into the Indian Ocean. The Ganale River has never dried up and gives birth to the possibility of sustainable life for these refugee camps, host communities, and Dolo Ado city. The road becomes less rocky and gives way to soft dirt as tall maize plants start to surround our vehicle. Birds sing and the air feels fresher the closer we drive toward the river. I notice some bananas and papayas as we step out of the vehicle. Awale proudly shows me the pumping station with its gigantic diesel pump that irrigates several mile-long canals that cut through over 80 hectares (198 acres) of well-cropped land. I learn from Awale that the land is equally split between the Somali refugees and the host communities. Each hectare is cut in half between one refugee and one host. They can grow what they like, but try to keep a variety so no one crop dominates the fields. Maize was the main crop of choice before the refugees came about nine years ago. It was consumed by both animals and humans. This is the first big harvest using the new pump and the new canals. 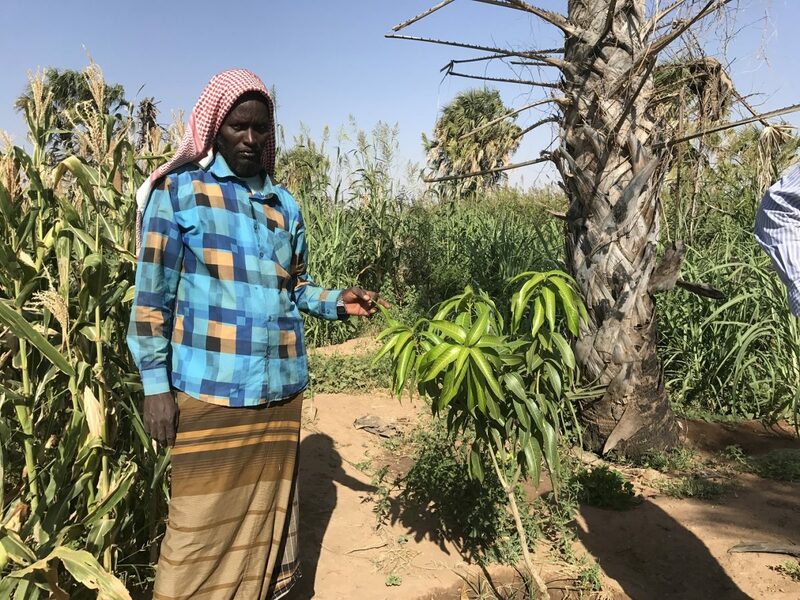 Mohamed Ibrahim, the agricultural chairman for the host community of Melkadida, reflects on how things have changed, as Awale translates for him: “You see, before the refugees came we had very little land to cultivate and our six water pumps were small and broke often. We had a lot of droughts. Yet we still managed to have good crops and make a living from farming. For now, UNHCR is funding the crops and the fuel that runs the pumps, plus fixing anything that breaks. In 2018, the farmers should make enough money off their harvests to fund any repairs, and the fuel and seeds needed in the future. They will then be a cooperative like the solar technicians and run their own businesses. Awale is working passionately at helping the farmers save seeds and learn composting. He strives for organic practices. He believes in even keeping some of the native skills of hand tilling the soil instead of bringing in large, expensive equipment that he feels only destroys the soil, making for more weeds that leads to more pesticides. Awale said, “Even though the farmers will have their independence we, at UNHCR, will be a consultant for them as long as needed, to help them constantly improve.” He sees solar powered pumps replacing the diesel ones as another advancement for their sustainable future. As we leave the farming site Ibrahim gives me several ears of corn to take home. The corn is much different than American corn. It is not sweet, but very filling and tasty. The food here seems packed with nutrients and flavors. Even though the peppers, tomatoes, and onions are much smaller than the U.S. versions, they taste better. The watermelon is so sweet with so many seeds it reminds me of the melons I ate when I was a kid in the ’60s. After months living in the camps, it is time for us to leave. As our plane rises from Melkadida’s new airport, which opened just a few weeks ago, I can see the camps far below. I imagine them becoming the sustainable cities that are hoped for, cities that may in the future have something to teach us.